Solar panels at the Noor Ouarzazate Concentrated Solar Power Plant. 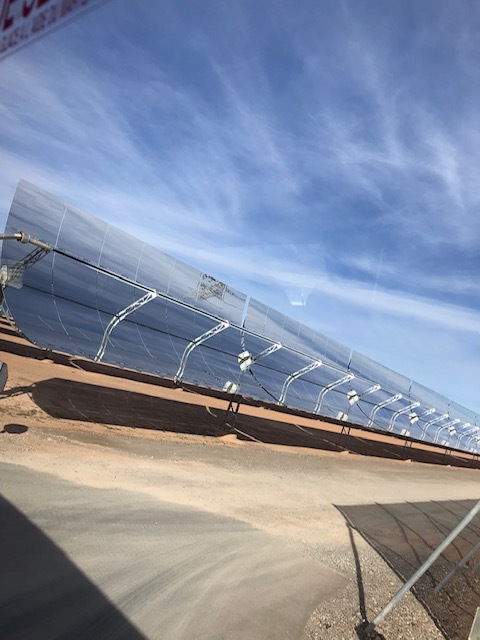 The summit was held at the heart of the hugely impressive and futuristic Noor Ouarzazate Concentrated Solar Power Plant. The largest facility of its kind in the world, it provides clean energy to 2 million Moroccans and accounts for one-fourth of the country’s solar energy target of 2 GW by 2020. It was the perfect setting for a conference unlike any other I have been to, characterised by a rare sense of optimism and opportunity around a topic – climate change – that is usually dominated by sobering news about greenhouse gases, increasing global temperatures and more frequent and extreme weather events and climatic shifts. I was there for the launch of the final report of the Itad-led evaluation of CIF’s contribution to transformational change. The launch of this evaluation was a big deal for CIF as it represented an independent assessment of how the $8 billion-fund has performed over the last decade and as such the report rightly received a great deal of attention. It was discussed in depth during the conference plenary by a very impressive panel including ministers (from Morocco, Niger and Zambia) and high-level representatives from the World Bank and the UK government, and got significant airtime during a number of the breakout sessions. A press release was also issued on the report during the conference. The evaluation itself was a highly complex undertaking and the result of nearly a year’s work from an expert evaluation team, who looked at CIF investments to support transformational change toward low-carbon, climate-resilient development in the areas of mitigation, resilience, and forests. Plenary panel for the launch of the transformational change reports. Our evaluation was centred around the idea of ‘transformational change’ in a climate investment context – a complex concept that is multifaceted and hard to even define clearly, let alone evaluate! While the Itad team were firmly independent, we worked closely with the Transformation Change Learning Partnership (TCLP) based in Washington, which is part of CIF, and we were able to build on much of the work that they had already done in this area – especially on the definition of transformational change (see a great blog by Anna Williams, director of the TCLP, on the topic of transformational change here)! The main evaluation questions were focused on unpacking the extent to which, and the process through which, the various CIF investments have contributed to positive ‘transformational change’ at the local, country and global levels. We conducted a theory-based evaluation (testing key hypotheses on which transformational change could be expected to come about) and collected a huge amount of data from a wide range of primary and secondary sources including in-depth country visits and interviews with global experts. As would be expected from such a wide-ranging evaluation, results were mixed – we found more concrete examples of advanced transformational change in those investments around clean technology (the Noor Solar Power Plant is a case in point!) than we did in programmes to address deforestation, for example. 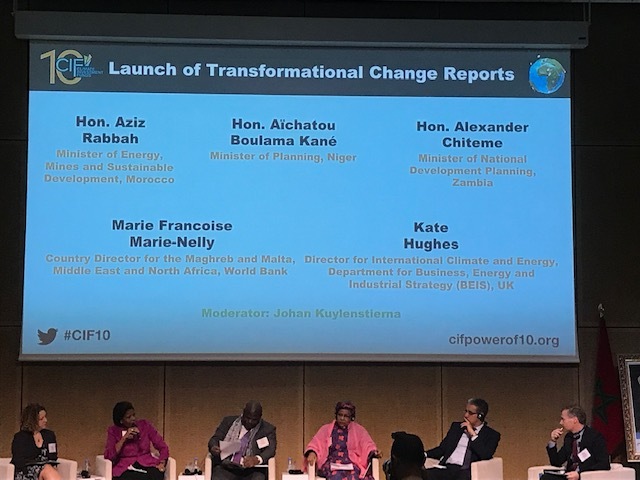 However, overall, the evaluation did find compelling evidence that CIF had positively contributed to transformational change in the climate sector over the last 10 years. Perhaps even more importantly, from a future policy perspective, we were able to highlight some of the main mechanisms through which transformational change can happen (examples include a country-led approach that aligns investment to national priorities, explicit consideration of barriers to systems-level change at the design phase and large-scale investments using concessional finance). Not surprising then, that the evaluation received so much attention at the event last week. For Itad, the completion of this evaluation is also something that we are keen to celebrate and build on. This evaluation is a key part of our growing climate evaluation portfolio (see, for example, our work on BRACED). In addition, the concept of ‘transformational change’ and the evaluation of how it can come about has a much wider relevance across all the sectors in which we work…I will bring the thinking around how to measure transformational change I garnered through managing this evaluation into the work that our health and education teams are doing in their sectors (what does transformational change look like with respect to Health Sector Strengthening programmes, for example?). Of course, the launch of this evaluation report was a key moment for me personally (my role in overseeing this evaluation has dominated my working life over the last year!) and the job has been a significant undertaking for the great expert team that Itad put together to carry it out[i]. In my experience, it’s truly rare to see an evaluation be afforded such prominence at events like these and it’s hugely rewarding to be part of a process where evaluation findings are being seriously discussed and fed into future policymaking discussions. This, of course, is even more the case when the evaluative topic is such a critical one for the future of our planet and the future generations that will inherit it. For the first time in my career, I think my kids were genuinely impressed by my trip report back from this trip! [i] The Core team members for this evaluation were Sam McPherson, Matthew Savage, Jessica Kyle, Johanna Polvi, and Tim Larson.